New nation-wide advocacy program for world languages coming soon! Check back for information on "Lead With Languages" in Fall, 2014. In the meantime, check out the first Public Service Announcement for the new campaign. Looking for 21st century skills for our students? Don’t forget world languages! The PDF format requires Adobe Acrobat Reader to open. If you don't have Adobe Acrobat, you can download it free.Download Adobe Acrobat Reader free . How does language learning support academic achievement? 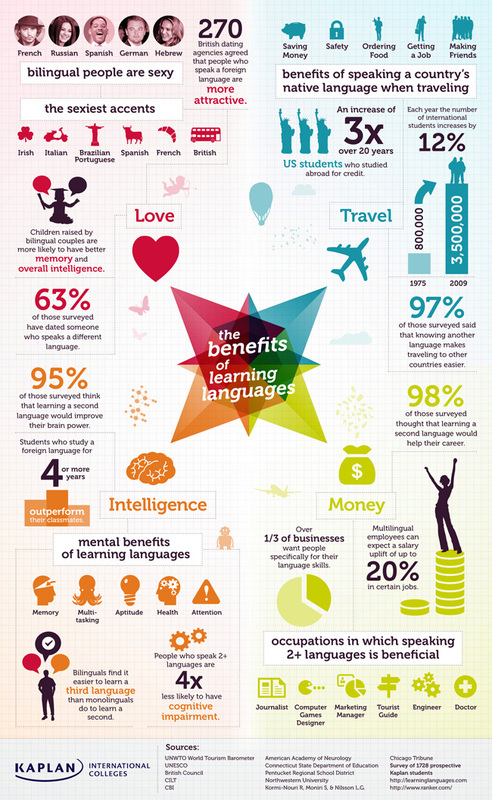 How does language learning provide cognitive benefits to students? How does language learning affect attitudes and beliefs about language learning and about other cultures? Is Bilingualism Valued in the U.S. Labor Market? Survey data regarding multilingualism and jobs Page from Champs Elysées, Inc., with numerous survey results regarding the benefits of language proficiency for jobs and careers. According to the Committee for Economic Development, America’s continued role as a global leader will depend on our students’ abilities to interact with the world community both inside and outside our borders. According to the Committee for Economic Development, many American students lack sufficient knowledge about other world regions, languages and cultures and as a result are likely to be unprepared to compete and lead in a global work environment. In 2011, Bloomberg ranked world languages other than English in terms of US business demand for employees with skills in other languages. The number 1 in-demand language was Mandarin Chinese. In descending order after that were: French (no. 2) and Arabic (no. 3), with Spanish ranking fourth. Russian, Portuguese, Japanese, German, Italian and Korean round out the top 10 languages needed by American businesses. More than one-third of businesses want people specifically for their language skills. Multilingual individuals can expect to earn between 2 and 20% more at their jobs than their monolingual colleagues, depending on the industry. There is a large (and largely unmet) demand for multilingual employees in journalism, computer games design industry, engineering, marketing and medicine. People who speak two or more languages are four times less likely to suffer cognitive impairments. Once you've learned one language, it is even easier to learn another one: research shows that bilinguals find it easier to learn a third language than monolinguals do to learn a second language. According to a 2012 statement by the Council on Foreign Relations, whose members include noted author Fareed Zakaria, "Americans who speak English alone will increasingly face a disadvantage in competing for some of the best jobs in business." A survey of American businesses operating oversees conducted by the Modern Language Association found that many companies give preference to candidates with foreign language skills when hiring new management personnel, provided other business experience and abilities are equal. Four out of five new jobs in the United States are created as a result of foreign trade, according to the National Council of State Supervisors of Foreign Language. Each year, 200,000 Americans lose out on jobs with business because they don’t know another language, according to Edward Trimnell, author of Why you need a foreign language and how to learn one. World language study increases SAT scores in English/Language Arts and Math. The more years you study the same language, the greater the increase in those test scores. Recent research indicates that individuals who are bilingual or multilingual reduce their risk of dementia. Knowledge of world languages has correlated to increased problem-solving capabilities in children. Knowledge of world languages has been shown to increase mental flexibility in children. According to a recent National Association of Colleges and Employers (NACE) survey (cited in the 2008 Global Competencies Task Force Report from the University of Wisconsin-Madison), “employers pointed out that they hire for core skill sets including [...] intercultural communication skills and an ability to listen and effectively engage others."